Signing soccer stars outside of the designated transfer windows may typically be a no-no, but London-based club West Ham United have made an exception in order to enter the world of eSports. Which of the best PC games would make the smartest eSports challenge? Take a look! According to statement made on its website, West Ham have just secured the services of Sean Allen – better known as Dragonn – to represent the club at official eSports tournaments, marking the first time a British team has made a move on the world of pro gaming. 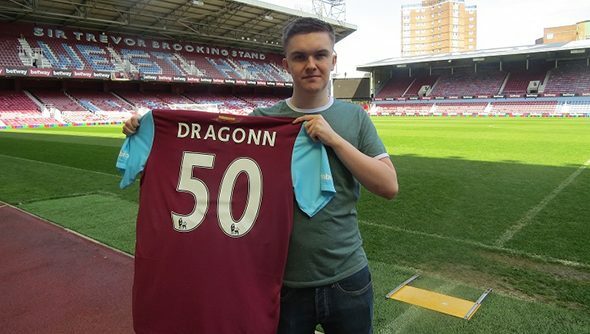 Naturally, West Ham are keen to talk up Dragonn’s standing in the world of eSports, noting that has came in as a runner up at the 2016 FIFA Interactive World Cup and has qualified for every ranking FIFA eSports event this year. His first gig as a West Ham player will come at the Play Like A Legend Grand Final, which is taking place as we speak at the Gfinity Arena in Fulham, London. Indeed, what makes this interesting is that West Ham’s validation of eSports comes in tandem with bold new plans for the club as a whole. Currently sitting in an impressive 6th place in the English Premier League with just a few games to go, next season will see West Ham move into London 2012‘s Olympic Stadium in the heart of the UK capital. It seems getting ahead of its rivals and making its mark on eSports – which the club acknowledges is “one of the fastest growing sports in the world” – is an important part of West Ham’s plans to grow its global fanbase. It’ll be interesting to see what impact Dragonn has both in the scores of FIFA tournaments he’s likely to be flung into this year, and on other soccer clubs around the world. Can we expect multiple eSports signings by other teams in the months ahead?